Hitty Constance and Hitty Rose received a wonderful gift from their friends in Quebec. A Czech artist created this glorious bed made of twisted wire, which came with a thick and comfortable buttoned mattress. 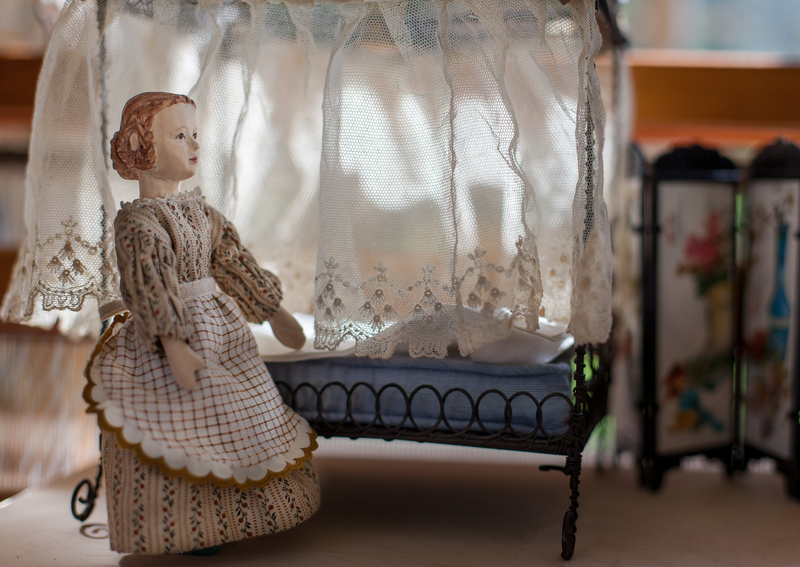 All the Quimper Hittys have to do is create some bed linens and hangings…fortunately they live in a household addicted to small scale textile arts. A scrap of old netting was dug out from the Human’s stash…Zipporah clothes-pinned it to the bars to see if it would do for the hangings. We decided it was a good match because of its old look and dainty scale. The human thought a little more length would have been even more perfect, but no complaints were tolerated by the Hittys. The pleats at the top of the net were unpicked so it could be washed and pressed. Then with trepidation we cut it into eight pieces, two for each side of the bed. 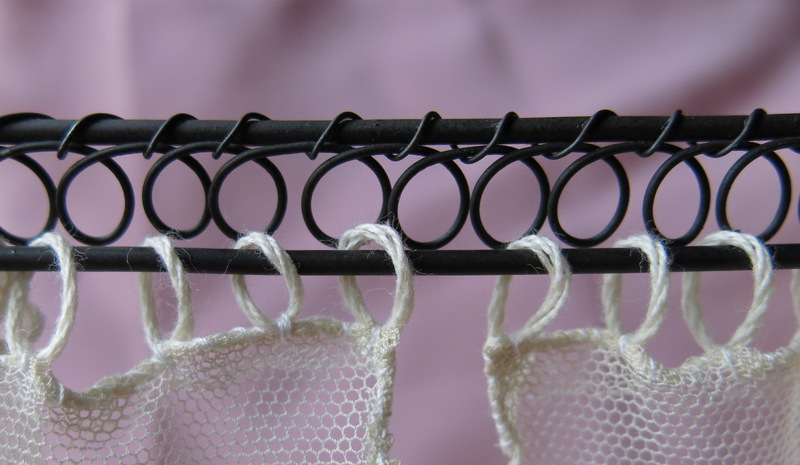 Since we couldn’t find curtain rings small enough, we looped and stitched cotton warp yarn to the top edge of the netting. 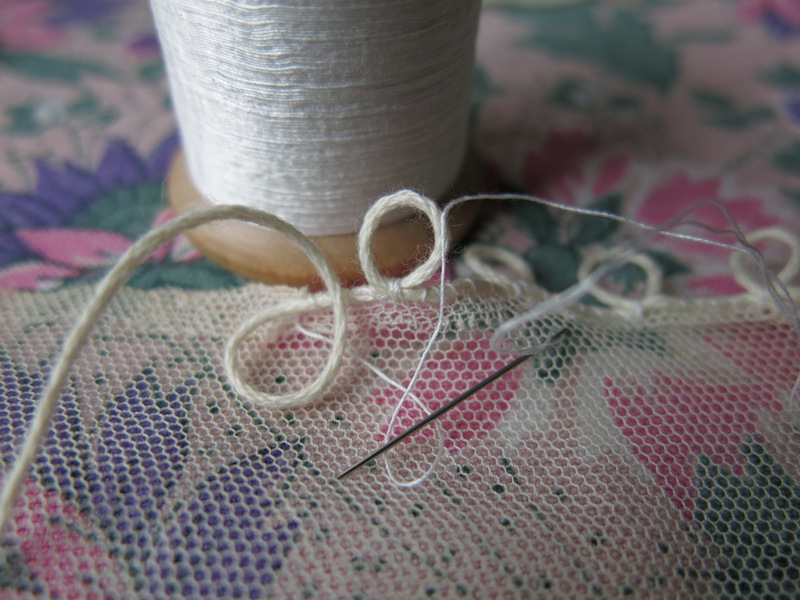 One hundred and twenty loops altogether make the net hang nicely…now on to the bed-clothes. Oh my goodness, how exquisite! The Hittys are going to have to take turns sleeping in their beautiful new bed. I am sure that it will bring them very sweet dreams! They do love it already and have noticed that it sleeps two very comfortably! Lucky Girls!! What a wonderful job you are doing for them. They must be thrilled with the gift and the additions…. 🙂 They were beside themselves when they realised the bed was going to be theirs! The girls are always gratifyingly appreciative at my efforts! Beautiful, oh, so beautiful. And what a clever solution to the bed rings! Lovely! 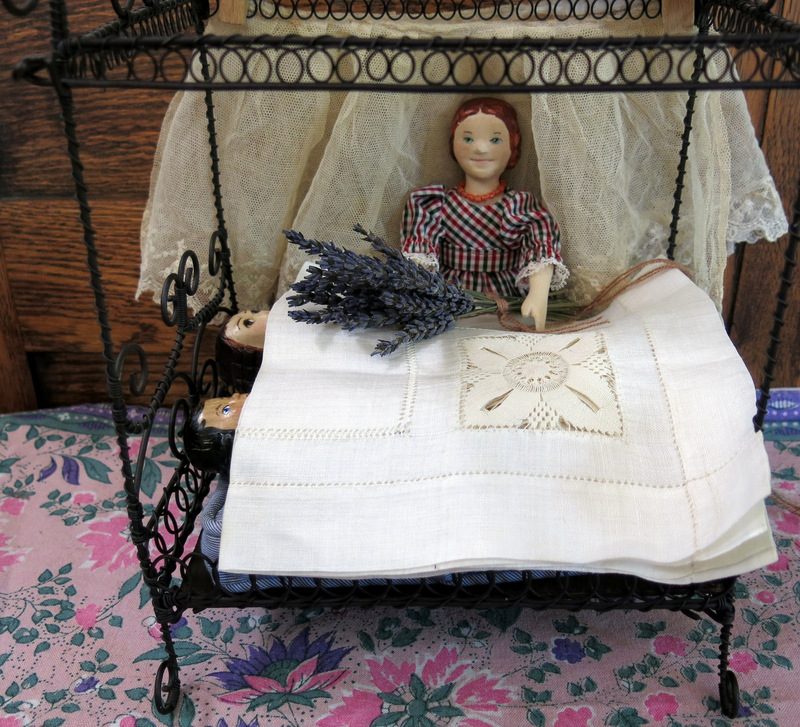 It is a beautiful bed, and it’s going to be like sleeping in a fairy tale! I had a (very) brief moment when I thought it would be nice to buttonhole the loops, fortunately I remembered there were 120 of them! Yes, totally lovely and creative. I’ve never seen anything like this beautiful bed! The Hittys are in ecstasies about it! The bed is wonderful the hangings the drapes and fittings will be lovely..and 120 hand crafted loops…..AMAZING!! As usual YOU and your girls are a beacon of gracious living for the rest of us. That bed really is a work of art and when you get done it will be a Masterpiece!!! We are having fun! The Hittys will have sweet dreams, I am sure of it! oh my! I want to be a Hitty, perchance to dream. Is the beautiful napkin the start of a coverlet? Aha you have a sharp eye! Stay tuned for snippings and stitchings! Sooooooo Nice that you are giving “life” to the bed….am positive it is VERY happy it landed in your expert, talented and loving hands!!!!! It was so fun to work out the best way to do the bed justice, and to make the Hittys happy!